It's the earthquake that rocked the GOP. At 6:30pm ET, S.E. Cupp and Stephanie Cutter are joined by Tim Phillips, President of Americans for Prosperity and Kiki McLean, former Advisor to Hillary Clinton for President. 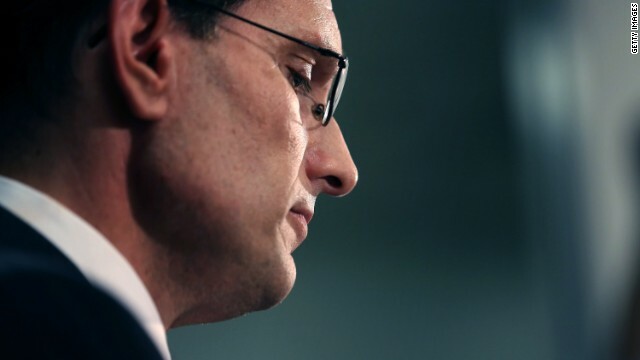 Will Cantor’s loss make the Republican Party stronger or weaker? Really can't wait to see Lindsey Graham,Kevin McCarthy,Sheldon Adelson,Rupert Mourdoch,Karl Rove,Hayley Barbour,Grover Norquist and the GOP stuff Jeb Bush down the tea party's throats EXACTLY like they stuffed Romney down. Straight no chaser. Again, it is time to return all Social Spending Programs to the States where they belong! The job of the Congress, in the domestic sector, within the confines of the Constitution, is to make the laws as fair as possible. Believer it or not, the people are more than capable of taking care of themselves. Where Welfare may be needed it will be up to the people in each state to set up and run such a Program. Trying to be all things to all people is an impossible task for Washington. And because of it, no one is paying for all the Programs and there is now nearly an 18 Trillion Dollar Federal Debt. Welfare and Medicaid are already run by the states. Right wing nonsense. And no, the poor people can't look after themselves.The health statistics from the Southern States are a disgrace to the US. Certainly Obamacare is flawed. A single payer system would be far superior, but anything would be better than the present, costly (17% of GDP) failure (35th in the World in average life expectancy). If you don't believe me check out the National Institute of Medicine. The US now has the lowest upward social mobility of any of the rich countries in the World, and the 'American dream' is now just a cynical myth propagated by Republicans. Are you saying the people in the states are too impaired to take care of themselves? So do you think is intelligent enough to do the job? You James? @Slagg – He's saying people like you (old and poor) would die if they didn't have SS and Medicare. So why do you continue to vote for the GOP who want to cut your SS and Medicare benefits? No loss in my book. Hopefully his replacement will have some COMMON SENSE. Common sense by the GOP? Get real! When has the GOP ever demonstrated common sense? Steffy, steffy, steffy.....You and Van must have taken the same "facial gestures for right-wingers" class. You both have learned the art of facile contortions for conservatives very well. Van makes his eyebrows go up and down while snickering, shaking his head back and forth and smiling that big toothy condescending grin of disgust. And you Steff, you have perfected that cocky tilt of your head to the side bulging your eyes as if in total disbelief that any sane person who champions conservative values is the biggest moron that ever lived. I watch the show to hear what both sides have to say regardless of what side I tend to favor. I'm a 66 year old grandma, raised by a mom and dad who kept their vows and met their responsibilities every day of their 45 year marriage. What they taught their kids was what they also practiced which included telling the truth, doing your best, giving of yourself to those in need and respecting and obeying the wisdom and guidance set forth in the Bible. That used to be a good thing when I grew up but not anymore. Is it any wonder we are experiencing more broken families and more violence in society. We have walked away from God and put government in His place. At any rate, I've said my peace and I stand by it under oath. I'll be watching. In response to Stephanie Cutter who is outraged by gun violence, and wants to pass a law that will stop it. Really ,what law would that be,more background checks, show me a shooting, that a background check would have stopped.Why is it everyone that knows nothing about guns, has never had one ,or even fired one, but they have all the answers about passing laws on them, remember this is why Piers Morgan lost his show.Common sense would tell you , maybe schools should have some security , so you just can walk in with a weapon, how about a metal detector ,you have to walk thru , to get in and maybe a security officer standing there by it. Wouldnt that be more helpful than a background check, oh wait a minute the NRA SUGGESTED THAT so we cant do that , that would be siding with the enemy wouldnt it, little girl.keep in mind , you have to live a little bit before you know something, and you are not really old enough to know anything. all you have now is an opinion,and we all know what they are like and everyone has one, Why dont you just live another 20 years and maybe then you will have an idea worth sharing, and remember children should be seen and not heard. Mr Brat is interesting; a professor of economics who doesn't have an opinion on minimum wage. Someone in his position should also know that productivity in the US has indeed risen, but wages have not kept up. Is there a word which rhymes with Brat which adequately describes him? I was thinking the same thing – I'm sure a lot of people are scratching their heads over that one.